The major drawback with PRINCE2© over the years has been its poor application to small projects. The PRINCE2 2009 literature included a section on tailoring for the PRINCE2 environment. Tailoring was also further strengthened in the PRINCE2 2017 refresh. Users found these a substantial steps forward but they still doesn’t quite address all the issues. You will have been trained on the full PRINCE2 method, and that is great. However in most cases the projects you then work on do not justify the full method being applied. As a new PM this leaves you with a problem. Because the first thing to do is to tailor the project management methods to match your particular project environment. However as new project managers lack experience in PRINCE2 it usually results in problems. Either the PM cuts too much resulting in PINO (PRINCE2 In Name Only). Alternatively the PM applies too much and get DBP (Death By PRINCE2). PRINCE2 2017 is better in this regard providing some recommendations about how particular PRINCE2 environments can be addressed. However you as the project manager are still left to select an approach. Of course with every PM in the organisation doing their own tailoring of the methodology very soon the organisation are not all running a consistent PRINCE2 process at all. Instead the organisation are probably running a wide range of tailored PRINCE2 methods. For you as a PM this isn’t much of an issue. However, for team members working on multiple projects the story is very different. A team member will see different approaches on each project and that is consequently very confusing. PRINCE2 is a common culprit but the same issues occur with other methodologies as well. However at PROJECT in a box we have developed some generic methods based on best practice and our experience to better fit your low and mid complexity Projects. Using our 20 year project management experience we have created our own n Step family of methods. These draw on our experiences in a wide range of sectors and countries. Our work personalising or creating Project Management methodologies for organisations feed in as well. This set of methods fits very well into the place where the traditional methods like PRINCE2, PMBOK and Agile are difficult to operate with. See the video to find out more on You Tube or here. We provide nStep as a collection of pre-scaled methods. 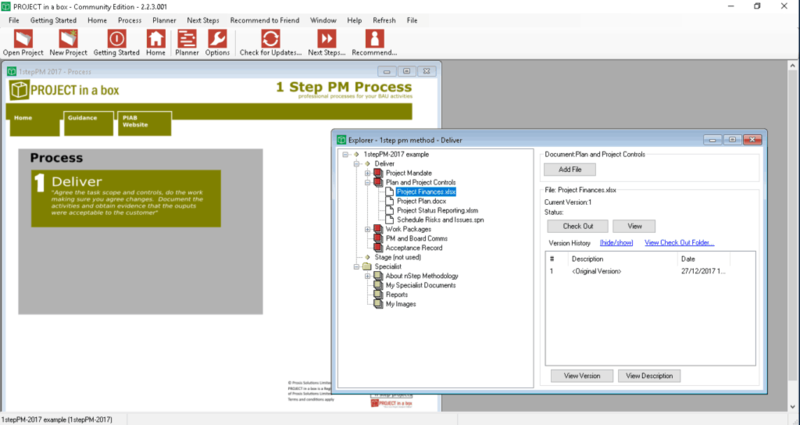 Helping you to support tasks from below the traditional project level with the 1 step method. 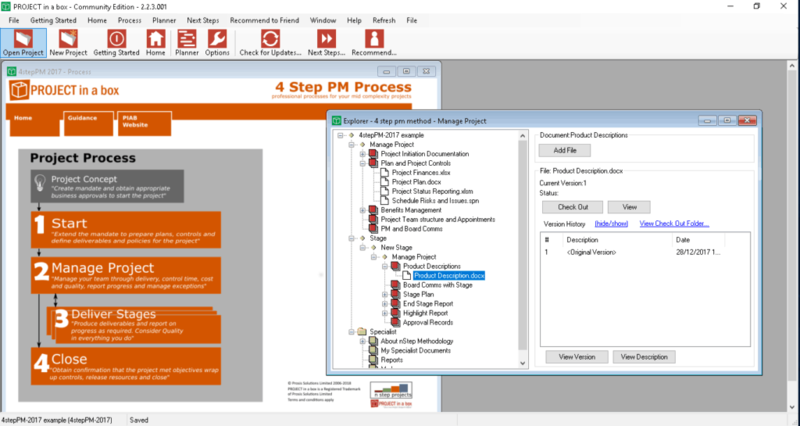 Through to your more complex projects with the 5 step method. The methods use consistent processes and documentation terminology throughout the family. This helps you and your users move between methods as they work on bigger projects. All the methods are all provided with templates. Some of the templates are the official PRINCE2 templates (which we are the original authors of). Some of the templates are the official DSDM Atern templates. Others templates we created ourselves based on our extensive experience. nStep methods are provided for free in all out products. Community, Small Team, Enterprise and Live Editions as well as in Your PMO. Users of Small Team, Enterprise and Live Editions can choose to have projects using Word or .piabx templates. Users of Community and Personal Edition will get Word templates only. piabx templates offer some great benefits for multi-user working and editing in the browser from any device. So lets introduce you briefly to the four current n Step Generic methods here below. We have also provided a video introducing you to the nStep methods here or on You Tube. Technically the 1 Step method is for the activities which traditionally sit below the project level, perhaps repetitive tasks or the thousands of micro projects which happen in organisations but the cost of applying a formal PM method to them makes them uneconomic to deliver. 1 Step is great here as it is the very basic work package definition and collection of controls data if you want (task, cost, risk and issue). So if you are working in a Multi user environment the task information can integrate into users resource requirements and other reporting. Provided as standard across all the PROJECT in a box products. 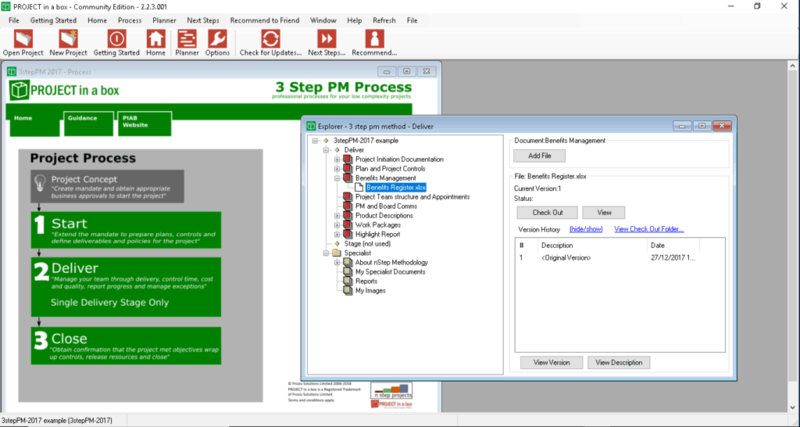 For your least complex projects, the 3 Step Project Management method provides definition, control and closure. Usually organisations have hundreds, even thousands of these projects, often treated a bit laxly or run by people with little formal PM training. With the 3 Step method you can be sure your project is set up quickly and consistently. Allowing you to focus on managing delivery. It includes tools for tasks and plan management, risk, issues and finances. Basically everything you need for your low complexity projects. You can also tailor it for your precise needs when the time arises. The 4 Step Project Management method helps you where the structure of the project is uncertain or odd and it literally has flexibility at its core. You choose how you want to mix these together and how many you want and as discussed you can add additional ‘types’ when you need them. This flexibility is real world and reflects the dynamic nature of many projects rather than the rigid nature of many methods and software tools. You would likely use the 5 Step method for more complex projects, those with deliverables which need dividing and managing either as gated stages or perhaps from different suppliers. Recognisably similar to 3 Step it adds further controls and a clear accountability to those sponsoring or directing the project because that change is more likely in the more complex environment. 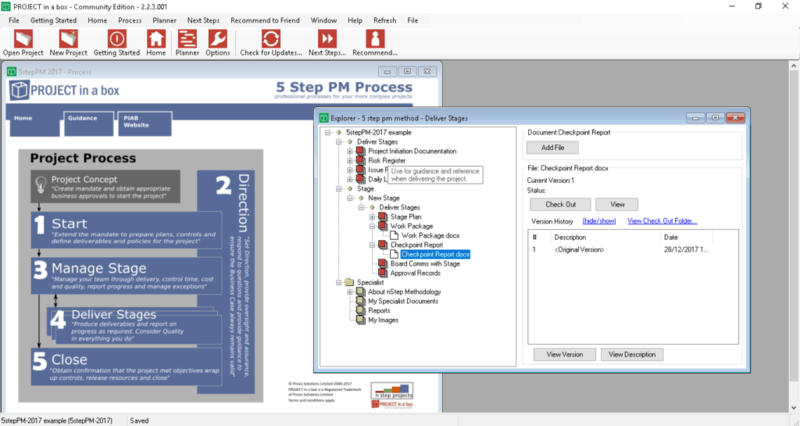 You get quick launch which presets the reporting sources and provides all the templates needed. This allows you to focus on delivery. The same as with 4 step you can add as many ‘stages’ to this project as you wish. As standard it comes with those from 4 step you can add additional ones as you find them helpful. Users of the free CE tool cannot change their method formats. Our commercial customers can personalise the methods, changing the documents, templates, navigation diagrams etc. As we have done all the hard work for you of assembling a scaled set of project management methods containing years of best practice learning, many organisations use these are the starting point for their maturing in-house standards. Note: this is permitted within your licence only for use via PROJECT in a box Software, not for use outside in an alternative document repository.